When we took our trip to Tanzania a few years ago, we really wanted to visit Zanzibar while we were there because we had heard such amazing things about the islands. We were not disappointed. Between the wonderful people we met, the beautiful landscapes around the islands, and the interesting foods that we got to try, it was an amazing experience. One that we are glad we were able to have, and one that we will never soon forget. A beautiful sunset in the harbor of Stone Town. Zanzibar has a long and troubled history, as it was the epicenter for the African slave market for centuries. Slaves captured in the interior of Africa were brought to Zanzibar by Arab slave traders to be shipped around the world. Zanzibar would be the last glimpse of Africa that most would ever see. You can still tour the slave market and holding cells today, which is a very somber and humbling experience. Zanzibar was also the launching spot for much of the exploration of Africa that took place in the 18th Century. Most notably, it was used as a launching spot for Dr. David Livingstone, the famous British explorer, and Henry Morton Stanley, the American newspaper writer who set off to find him. If you have never read about the story of Livingstone and Stanley, there is an amazing book out called Into Africa that I would highly recommend. The islands of Zanzibar play a prominent role in that book. Much has changed since the days where slave traders and explorers used Zanzibar as a launching spot for their exploitation and adventures, but much has also remained the same. Zanzibar still has a busy port that is used for the shipment of a large amount of goods, and the islands still have a culture and identity that sets them a part from mainland Africa. While technically part of Tanzania, the islands of Zanzibar have a different vibe. It’s a laid back vibe that makes it very easy to forget about the stresses of travel and just relax, which is exactly what we did when we visited. Whether you are looking to visit some of the island’s amazing beaches, tour the history of Stone Town, take one of the fascinating spice tours, or you have just come to try the world famous Zanzibar Pizzas, the island is a great destination for those visiting Africa and looking for a change of pace during their trip. Zanzibar is technically part of Tanzania, which means that the immunization requirements for Tanzania also apply to Zanzibar. Depending on which country you are arriving from, you may need to have a Yellow Fever vaccination to enter the country. 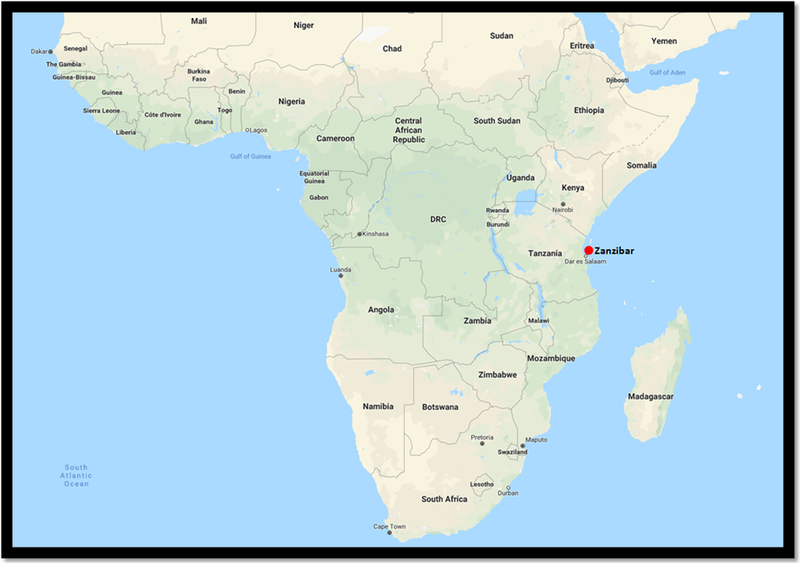 If you are travelling to Zanzibar from another country in Africa, please use the US Centers of Disease Control (CDC) website to determine if you will be required to have proof of the Yellow Fever vaccination to enter. Zanzibar Islands are located off the coast of Tanzania. Technically, Zanzibar is made up of many islands, but the largest one (Ugunja) is what is most often referred to as Zanzibar. The islands sit roughly 48 miles off the coast of Tanzania, just Northeast of the capital city of Dar es Salaam. The capital of Zanzibar is Zanzibar City, which is most often referred to as Stone Town. It sits on the Western Coast of Zanzibar, and is the home of Zanzibar’s large shipping port. The Eastern coast of Zanzibar is where you will find all of the beautiful, white sand beaches that make Zanzibar a famous beach vacation. No visit to Zanzibar is complete without visiting its pristine beaches. The easiest way to visit Zanzibar is to fly into Zanzibar City. There are plenty of affordable flights that arrive from destinations across Eastern Africa daily, so finding a flight shouldn’t be too much of an issue. 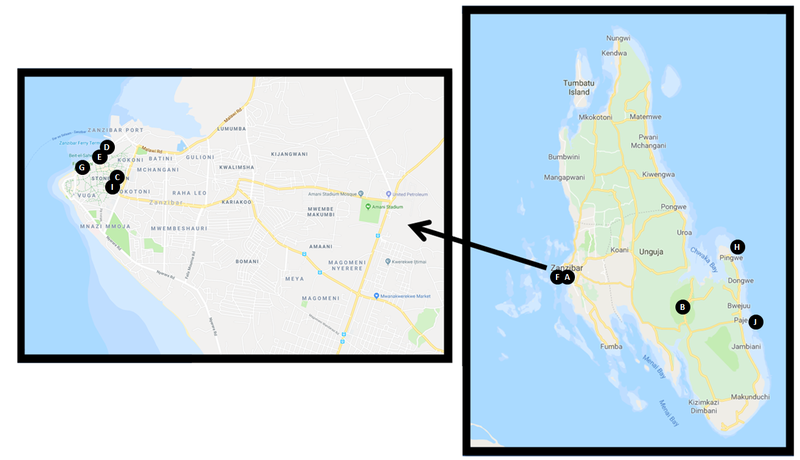 If you are visiting Zanzibar from Tanzania, there are daily flights that go from Arusha, to Dar es Salaam, to Zanzibar City and then back multiple times a day, so you have a lot of flexibility in when you travel. Tickets typically cost around $100.00 USD for a one way ticket from Dar es Salaam to Zanzibar City. 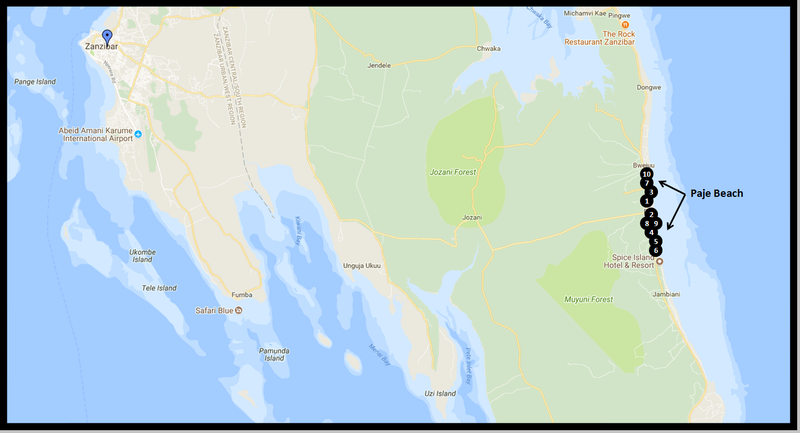 If you are traveling to Zanzibar from Dar es Salaam, you also have the option of taking a ferry boat from mainland Tanzania to Zanzibar. Azam Marine Company’s Kilimanjaro Fast Ferries can take you from Dar es Salaam to Kilimanjaro in approximately 2 hours. Tickets are available in economy class for $35 USD or business class for $50 USD. The sunsets in Zanzibar are absolutely amazing. Zanzibar is located near the Equator, so no matter when you visit, you should expect hot weather. Remember, it is also in the Southern Hemisphere, so the winter and summer seasons are opposite of what we have in the Northern Hemisphere. Zanzibar is also subject to the Monsoons, so you if you want to avoid heavy rains, you will want to avoid visiting during the Monsoon season. Because of its location near the Equator, Zanzibar sees fairly consistent, hot weather year round. The summer months of December thru early March see the warmest temperatures, with the winter months of late May thru early August seeing the coolest. No matter when you visit, you will want to bring protection from the sun with you. Zanzibar is also subjected to Monsoon weather, so being aware of the weather before traveling to Zanzibar is very important in that aspect as well. For instance, during the months of April and May, Zanzibar typically sees over 10 inches of rain. If at all possible, I would avoid traveling to Zanzibar during these months. The winter months of June thru September are much drier, with an average of only a couple inches of rain falling during these months. These are the months that I would target for your trip if you are looking to do a lot of outdoor activities. Paje Beach on Zanzibar is the perfect place to unwind. There are a lot of fantastic places to stay in Zanzibar, so you do have plenty of options when making lodging arrangements. In addition to a fine selection of hotels in both Stone Town and the Paje Beach area, there is also a wealth of properties available for rental on Airbnb. To give you a sense of when the lodging on Zanzibar island is cheapest and when it is most expensive, I have included a chart below that outlines the average pricing of hotels per month of the year. As you can from the chart, prices are the lowest between August and December each year, and most expensive in February and between May and July. 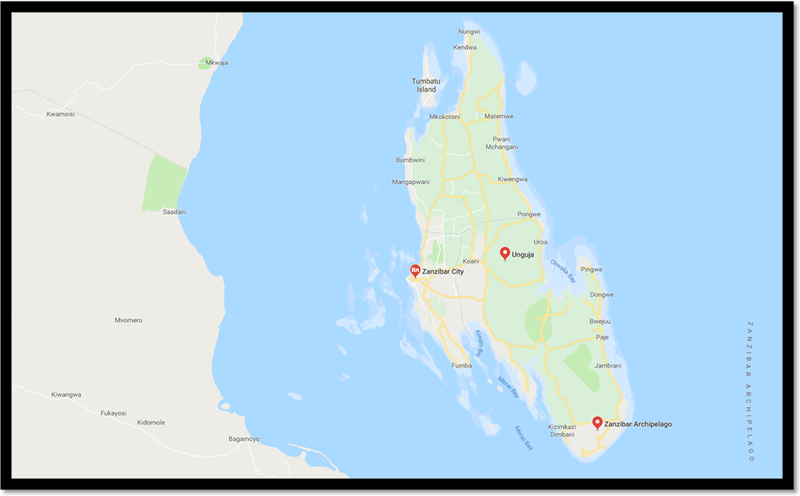 If you are planning to visit both the Zanzibar City (Stone Town) and Paje Beach areas during your trip, then I would recommend that you book separate accommodations in each area. I have included some great hotel options below for you to review, but there are also a lot of great options for properties to rent thru Airbnb as well. No visit to Zanzibar is complete without a stop in Stone Town, which is the capital city of Zanzibar. To assist you in finding the accommodations in the city that are right for you, I have included ten very good hotel options below for you to review. Paje Beach is one of my favorite areas of Zanzibar. If you are looking to spend some time relaxing on the beach, then a stop in the Paje Beach area is an absolute must. To make it easier for you to decide on which accommodations best fit your needs, I have provided ten great hotel choices below for you to review. 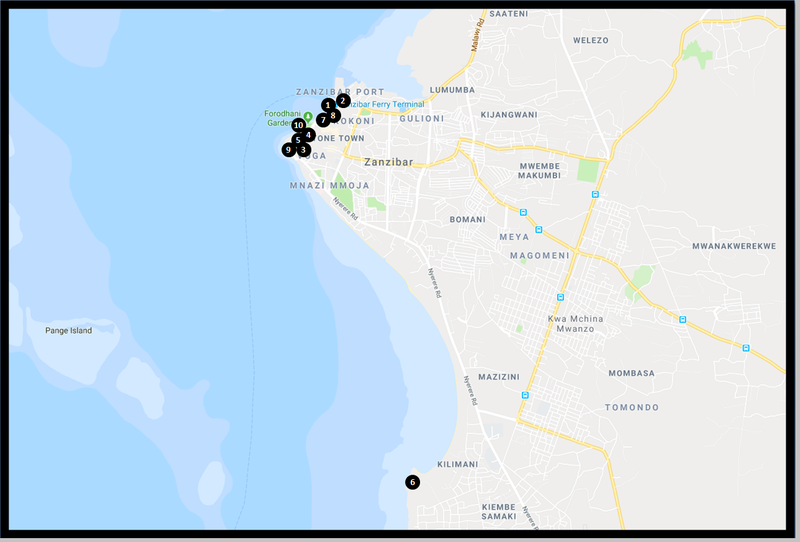 In addition to this visitor’s guide, I have included some additional resources below that you can use when planning your trip to Zanzibar. With its beautiful beaches, wonderful food, and wealth of historical sites, you will not find a shortage of things to see and do while in Zanzibar. To assist you in planning the most memorable trip possible, I have outlined my top things to see and do in Zanzibar below. Children jump into the ocean at the harbor in Stone Town to escape the heat. Zanzibar City, which is commonly referred to as Stone Town, is the heart and soul of Zanzibar. Not only is it the island’s capital, but it is also holds many of the island’s main tourism draws. Between the bustling markets, plethora of historical sites, and beautiful harbor, Stone Town is a must see for anyone visiting Zanzibar. When you visit Stone Town, make sure you make it to the harbor at sunset. There are plenty of food vendors near the harbor, so it is a great place to relax and eat dinner. Not to mention, the sunsets are absolutely fantastic! Red Colobus Monkeys are some of the Jozani Forest’s most famous inhabitants. If you are into wildlife, then you have to visit the Jozani Forest during your visit to Zanzibar. The Jozani Forest Preserve is one of Tanzania’s lesser known national parks, and also one of its most underrated parks. The wildlife you have a chance to spot in the park include Red Colobus monkeys, sea turtles, Tree Hyrax, chameleons, dolphins, Zanzibar Leopards, and over 40 species of butterflies. If you would like to visit the park, I would suggest you arrange a safari thru one of the local outfitters. To assist you in finding a safari that meets your needs, I have included a list of outfitters that are highly recommended below. The Forodhani Market in Stone Town. If you love to visit markets when you travel, then you are going to love the Forodhani Market in Stone Town. This famous open air market has been in operation for centuries and is world renowned for the spices and other other local foods that are available. In addition to being able to purchase spices such as cinnamon, Turmeric, Paprika, Cumin, Saffron, and Cardamom, you are also able to find Zanzibar staples such as the famous Zanzibar Pizza and sugar cane juice to enjoy. 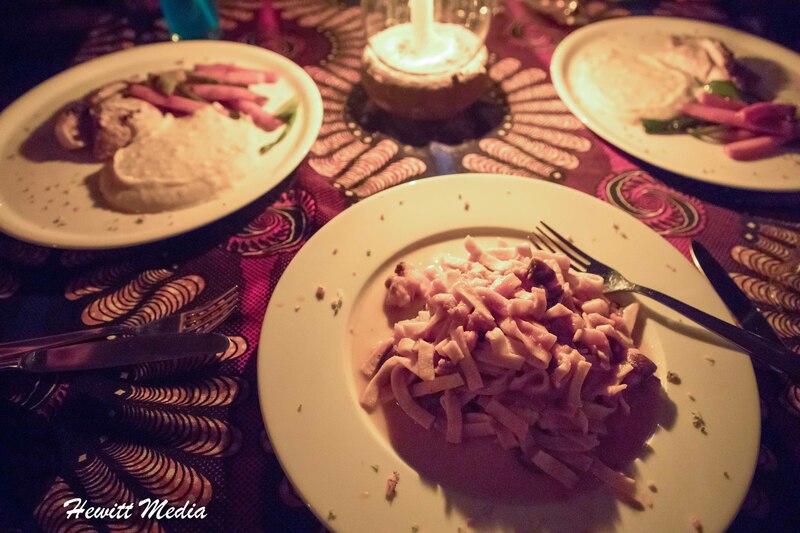 If you are a foodie, then the Forodhani Market should be at the top of your list of things to see in Zanzibar. A vendor prepares a Zanzibar Pizza in Stone Town. Zanzibar Pizza may be one of the most unique food items that I have ever come across in my travels. It is unlike anything I have ever seen. These crispy stuffed snacks are filled with a variety of different ingredients and then pan fried until the exterior of the dough is crispy and the inside is gooey soft. You will find everything from chicken, to sea food, to avocado and veggies, to snicker bars inside them, as each vendor you visit offers their own interpretation of this unique dish. It is definitely a must try experience for foodies who like to explore the local cuisine. The Palace Museum in Stone Town. Built in the late 19th century to serve as a residence for the Sultan’s family, the Bait As-Sahel (or Sultan’s Palace) was handed over to the people of Zanzibar after the Zanzibar Revolution in 1964, and then turned into a museum in 1994. If you visit the museum today, you can expect to learn about the history of Zanzibar and the history of the royal family who once lived in the palace. Spices for sale in Stone Town. Known as the African Spice Islands, Zanzibar is famous for the wide array of spices that it produces. While it is no longer the leading producer of spices such as cinnamon, Turmeric, Paprika, Cumin, Saffron, and Cardamom, these spices still play a very large role in the local economy. It isn’t difficult to find these spices for sale in the Forodhani Market or at other street vendors around Stone Town. If you are into cooking, it can be a really neat experience to go on a spice tour to see how these spices are produced and distributed. If you are interested in taking a tour, I have listed a number of recommended tours below for you to review. The Old Fort in Stone Town. The Old Fort, which is sometimes also referred to as the Arab Fort, is the oldest building in Stone Town and one of its largest tourist attractions. The fort is open to visitors and you will often see vendors selling merchandise inside the forts walls. The fort also includes a restaurant, and on most nights you can find live music and dancing in the forts open air amphitheater. The Rock Restaurant near Paje Beach. The Rock Restaurant is my favorite place on Zanzibar and is one of the most unique and beautiful restaurants I visited in my many travels. I mean, it’s not often that you get to take a boat to a restaurant surrounded by the ocean to eat. If you haven’t read my review of the Rock Restaurant, I suggest that you do to learn more about this amazing place. If you are looking for a tropical destination with beautiful beaches and warm, welcoming people, then Paje is the place you want to be. The Paje Beach area had some of the most beautiful beaches I have visited. The area is perfect for swimming, sun bathing, water sports, and just enjoying the island life. If you do visit the area, make sure you stop by the Rock Restaurant for a one-of-a-kind dining experience! Memorial to the slaves held in the Stone Town Slave Market. Everyone who visits Stone Town in Zanzibar should stop by the old slave market to understand just how dark and sad this period of Zanzibar’s history was. For centuries, Zanzibar was the epicenter for the African Slave Market, and the remnants of that dark history can still be seen today. There were three big slave markets on the island of Zanzibar at the time, but the most infamous and horrifying was the one in Stone Town. In the courtyard of the Anglican Cathedral and St. Monica’s Hostel on New Mkunazini Road, there are two slave chambers that are open to viewing by the public. There are also statues that have been erected in remembrance to this horrible piece of history that took place there. To think, upwards of 70 slaves at a time were kept in these miserable chambers, only to be shipped off soon after and never see their homes again. What a sad and horrifying period of history this was. Zanzibar is an incredible place. There are so many beautiful things to see and fun things to do. In order to give you a better understanding of what it is like to visit Zanzibar, I have included a gallery with just some of the pictures we took on the island below.